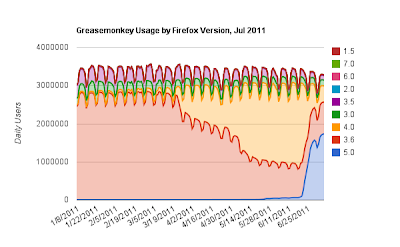 I wrote a very similar post three months ago, but there's been a lot of real motion along Mozilla's fast release track since then. It's worth revisiting these numbers: Click for a larger image, or browse the data in Google Docs, with a larger view and a line chart as well. 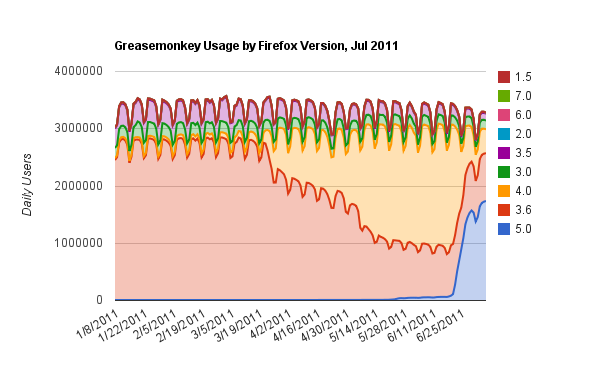 Or: Version 3.x (1,066,116) is still one third of total usage (3,135,233). And even if 4.0 is dropping quickly, right now it's still almost a quarter of the total post-3 users.